I love this juxtaposition of unexpected data! Let’s turn it into a math project. Can we rank Olympic performance not just by medals, but by medals compared to a country’s size? How do we measure size? Area or population? Is it significantly different? How do countries vary by summer and winter performance? What if we compare medals to other data, like gross domestic product, human development index, or the age of each country? Do any of these factors tie into Olympic performance? Wikipedia has an awesome all-time Olympic Medal table, sortable by summer, winter, and total medals. Want to try gross domestic product or human development index? Do countries with stronger economies perform better in the Olympics? work with large numbers, ordering, adding, or subtracting. And everyone should be analyzing the data they generate to look for patterns. Kids should form generalizations about size vs medal count, summer vs winter performance, medals vs economics, etc. A bonus application for all ages is to use a spreadsheet to track data, make calculations, and create graphs. Doing this takes the emphasis away from calculation (which can become tedious) and places it on analysis (which is creative and exciting). We’re really working with pure statistics here, so perhaps our students take on the role of a statistician, looking for hidden patterns underneath the data. A natural technique for this expert is to take raw data and graph it, visually spotting interesting trends. Here are a few sample graphs I made to whet your appetite. 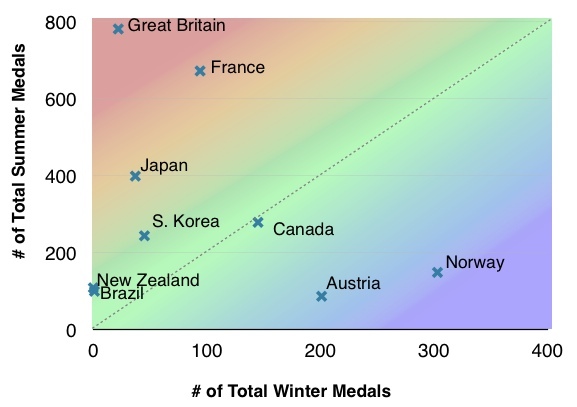 This scatterplot compares total Olympic medals vs population in millions using nine countries. France and Great Britain are not only physical neighbors, but are medal neighbors as well. South Korea/Austria and Canada/Norway pair up nicely also, despite being physically quite distant. 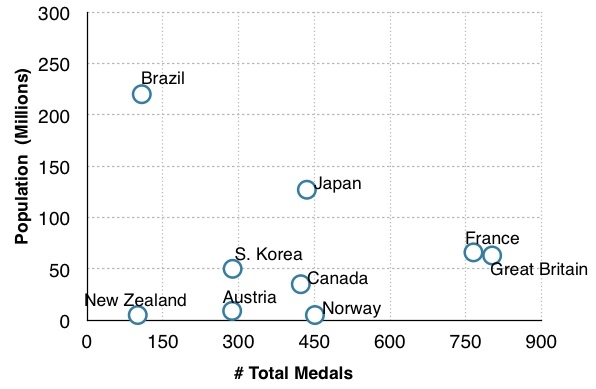 Brazil and New Zealand are population outliers, but have nearly identical medal counts. New Zealand, Austria, and Norway are similar in population, but their medal counts jump significantly. Japan strikes a near perfect balance of large populations and medal counts. Canada is the closest to a perfect balance between summer and winter. Norway and Austria are strong in winter, but weak in summer. Brazil and New Zealand share an almost identical ratio. If your students are older, have them calculate ratios. Perhaps total medals per million people? Norway may only have 5 millions citizens, but with 451 medals, each million people get to share 90 medals! Because of a large population and small medal count, Brazil’s citizens only get half a medal per million people. 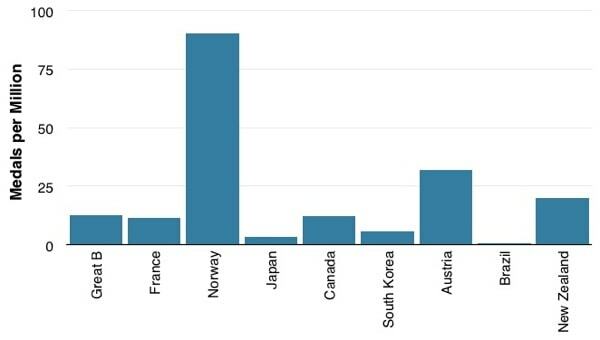 Great Britain, France, and Canada have remarkably similar ratios of ~12 medals per million. New Zealand may only have 100 medals total, but with a small population, each million get 20 medals. And of course there’s no reason not to graph these ratios as well! It’s fun to let kids select their own countries to analyze (probably no more than ten), but beware of countries like the US, China, or India whose medal counts or populations absolutely destroy the graphs’ scales. Unless, of course, that’s the point of the lesson (perhaps you’re teaching logarithmic scales?). Please let me know what you do with this and what your students come up with!